Unusually technical. With hole names like "Jail", "Death Row" and " Conjugal Visit", you know you are gonna get punished. $5/day. Reservations required - call ahead to schedule. Follow FM 2929 out of Huntsville to 450 Four Notch Rd. (Boswell Rd.) Call if you get lost. Bring a bag full of disc because you are going to need every shot imagineable. Lots of shade. Very challenging course. A "Must Play" if you are in the area. I thoroughly enjoyed to course. I gave this course a "5" because it is truly a top notch course. It is very well maintained and the holes are diverse and challenging. Much of the course is shaded because of the pine trees (which is very nice in the hot summer). 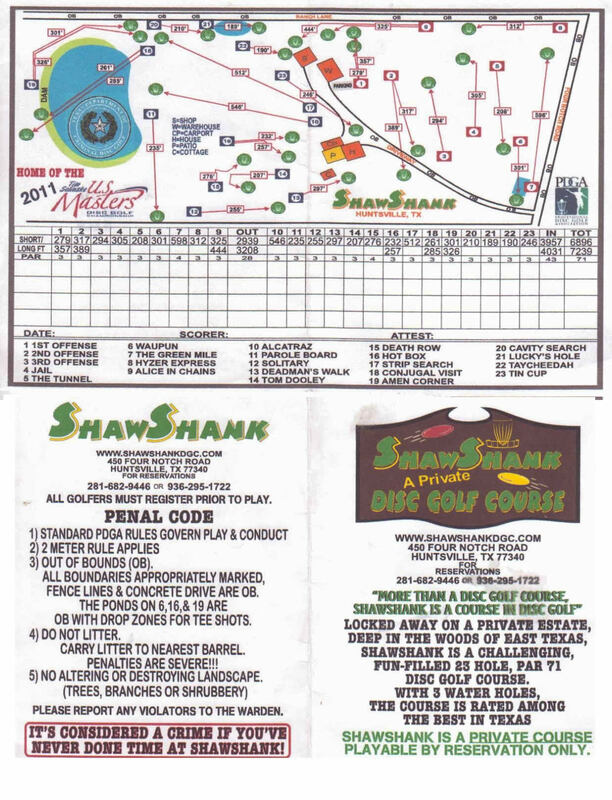 The entire course is themed after the movie "Shawshank Redemption" which is a nice touch.